We’re going to break this down into different categories to help make it easier to find what you’re looking for. The one thing to note here is that Android apps are placed throughout the various categories where they make the most sense, but we also include a section at the end for Android apps that don’t fall into any one specific category. Pretty simple, really. Let’s go. Microsoft Office: Thanks to Android app availability on Chromebooks, Microsoft Office is little more than a download away. You can get Word, Excel, PowerPoint, and even OneNote from the Google Play Store. 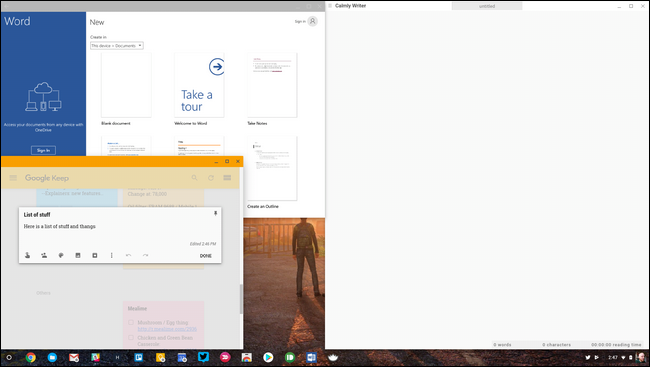 They run beautifully on Chrome OS—you just need an Office 365 account to use them. Google Drive: If you’re not on the Microsoft Office train, then Google Docs, Sheets, and Slides (all part of Google Drive) likely fit most of your needs just fine. Drive is a full-featured office suite that provides the features most users need. Since it’s web-based, Drive works across the board on all Chrome OS devices. Android apps are also available, though the web versions are generally superior here. Keep or Evernote: If notes or lists are part of how you live your life, you need a place to store them. Keep is great for its simplicity, but Evernote is a good choice if you’re looking for something a little more robust. Both apps are available on the web and as Android apps, but we think the web versions will suit most Chrome OS users better. Keep: Android, Web; Evernote: Android, Web. Google Calendar: For many people, Google Calendar is a must-have app. It’s available on the web and as an Android app. Both versions are great, so take your pick. Slack: If you work online, there’s a good chance your team uses Slack to get its chat on. Like most of the other things on this list, Slack has an Android app and a web interface, though we think the web interface is probably the better choice. Trello or Wunderlist: If you like lists and prefer something a little different than Keep or Evernote, Trello and Wunderlist are both excellent tools for the job. Both apps have Android and web versions, but we find ourselves using Trello’s Android app most of the time. Trello: Android, Web; Wunderlist: Android, Web. Calmly or Writer: If you’re looking for simple, distraction-free writing, Calmly ($4.99) and Writer ($2.99) nail it. These are both Chrome Apps, so they’re available exclusively in the Chrome Web Store, and only on Chrome OS. Gmail or Inbox: You can’t really have a productivity list without at least mentioning email, and almost everyone on earth uses Gmail at this point. The web versions of both Gmail and Inbox (depending on which interface you prefer, of course) are excellent, but don’t underestimate how fast and efficient the Android apps can be. If you find the web interfaces to be heavy or clunky, give the Android apps a shot: Gmail, Inbox. Photo editing is easily one of Chrome OS’ weakest points, but it has gotten better over the last few years. And with the launch of Android apps, there are actually some legitimately good options now for simple photo edits. Polarr: Polarr is a completely web-based photo editing tool that can be likened to Adobe Lightroom. There’s a free version that can do some things, but unlocked to its full potential will set you back $20. There’s also an Android app, though it isn’t as powerful. Pixlr: If you’re looking for a “Photoshop replacement,” Pixlr is as close are you’re going to get. It’s totally web based and completely free to use, though it’s fairly heavy on ads as a result. 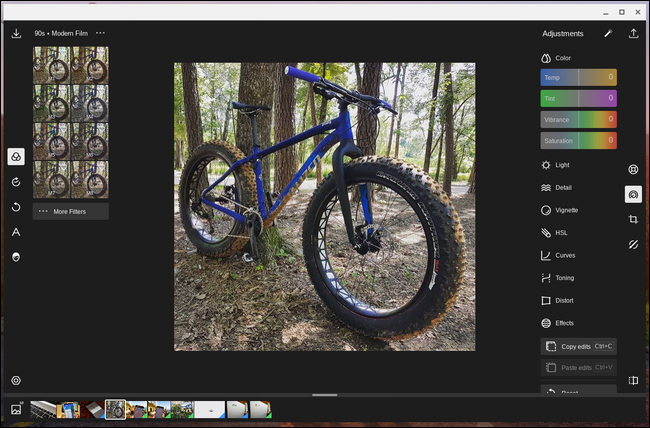 That said, it does pretty much everything most users would want from a photo editor, especially on a Chromebook. Adobe’s Android Suite: Adobe has a ton of Android apps to choose from, and while they’re not as powerful as their Windows or macOS counterparts, they’re at least something. Photoshop and Lightroom are both good starting points, though you may also want to look into some of the more specific options like Photoshop Mix and Sketch. PicSay Pro: This is an Android-only option, and it’s my go-to photo editor on Chrome OS. My needs are pretty specific, and this fits the bill perfectly. It’s simple and fast. Can’t ask for more. It comes in both free and paid variants. Skitch: So this one is a little difficult to recommend because it’s no longer in development and thus not available from the Play Store, but it’s by far the easiest markup tool we’ve found on Chrome OS. 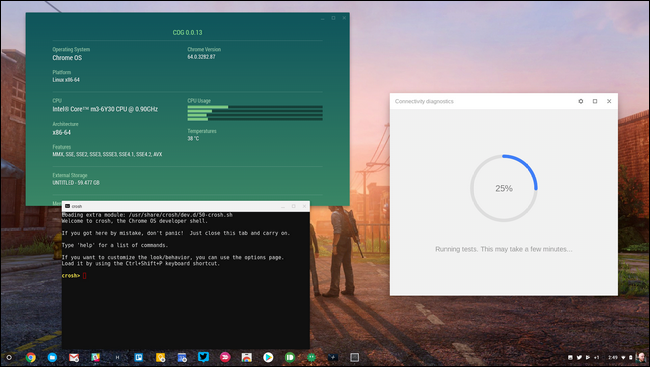 Because it’s no longer available for download, however, you’ll need to have your Chromebook in developer mode so you can sideload it. There are more than just apps available on Chrome OS—extensions are a huge part of what makes Chrome great in the first place. Extensions provide a way to add functionality to your browser where it otherwise may be lacking. Authy: If you already use Authy for two-factor authentication (and you should), this extension adds it to your browser for easier access. There’s also a Chrome app. Ink for Google: Google had some pretty ugly web designs in the past, which Material Design mostly fixed. The thing is, not all of the company’s web apps have been updated, leaving you sometimes stuck with an old, hideous interface. Ink for Google fixes that by adding Material Design to most of the popular Google sites. Good stuff. OneTab: If you find yourself with dozens of tabs open all the time and want a way to save them all for later reference (instead of just leaving them open or bookmarking them), OneTab is an invaluable resource. It helps you collect and organize groups of tabs, thus reducing both clutter and system resource usage. It’s a must-have. Pocket New Tab: This extension replaces your new tab page with one that brings Pocket integrated stories front and center. It still looks clean, and offers quick access to your most used apps and Google search, so you’re not missing out on any functionality. Pushbullet: Pushbullet is one of our favorite things of all time when it comes to integrating Android devices with our computers. It lets you quickly send and receive links, small files, text messages, and more right between your computer and Android device. It’s worth noting that the free functionality is limited, however, so if you want the full shebang you’ll need to cough up $40 a year or $5 a month. Chrome Remote Desktop: Sometimes you need access to another computer that runs Windows or macOS. That’s where Chrome Remote Desktop comes into play. It’s a super efficient way to remotely access your other computers. It’s worth noting that there is also an app for this in the Chrome Web Store, though the new web version will eventually take its place. Cog: This tool shows system stats and all that in real time. And it’s pretty. Crosh Window: If you use Crosh often (for things like Crouton), this little app should save you some time. It brings up Crosh in its own window, much like the command prompt on Windows or Terminal in Linux. It’s also worth noting that it requires Secure Shell before it will work. Life isn’t always about getting work done, so having some options to just kick back and relax is always a good thing. Google Play Music, Spotify, and Pandora: Look, everyone likes music, and you’ve probably already settled on your music player of choice. All of these apps have web versions and Android apps, though we tend to prefer the actual apps on the Chromebook. 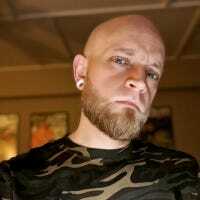 If you want to check them out, here you go: Google Play Music, Spotify, Pandora. There’s also a pretty solid extension for Play Music if you use the web version. Netflix: Movies! Shows! Original content! There’s all sorts of good stuff on Netflix. It works really well on the web, but if you want to save videos for offline playback, we recommend using the Android app instead. It’s great on Chrome OS. Pocket: There’s a lot of great content to read on the web, and there’s more great content put out every single day. If you often find yourself discovering awesome stuff you don’t have time to read, Pocket is the answer. Just read it later! This is also available as an Android app, though we find the web version a little nicer on Chrome OS. Google Play Books or Kindle : Google Play Books and Google Newsstand are both great for reading eBooks, but if you’re a Kindle person you can use that too. Play Books and Kindle are also both available for Android: Play Books, Kindle. Google Newsstand and Feedly: If you’re a news hound, both Newsstand and Feedly can aggregate the stuff you care about for easy, fast reading. Newsstand also does magazine subscriptions, which is awesome. YouTube: You already know how great YouTube is is on the web, but the Android app also lets you save videos for offline playback. Good stuff. 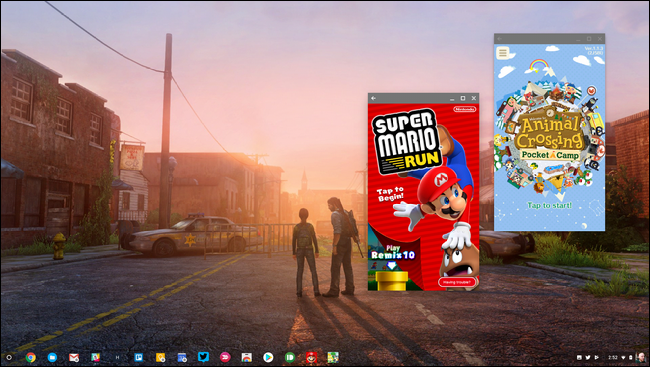 Chrome OS isn’t really known for its gaming prowess, but the addition of Android apps brings some damn fine titles to this little OS. In fact, there are a lot of great games available for Android, so we’ll try to be brief here. Asphalt 8 Airborne: Killer racing games that works exceptionally well on Chromebooks—both in tablet mode and with a keyboard. Get it. Roblox: More different blocks and stuff. Hearthstone: Lots of people love this game, and you can play it on your Chromebook. Or Chromebox, whatever. Emulators: Pair a Bluetooth controller with your Chromebook and get your retro game on, son. 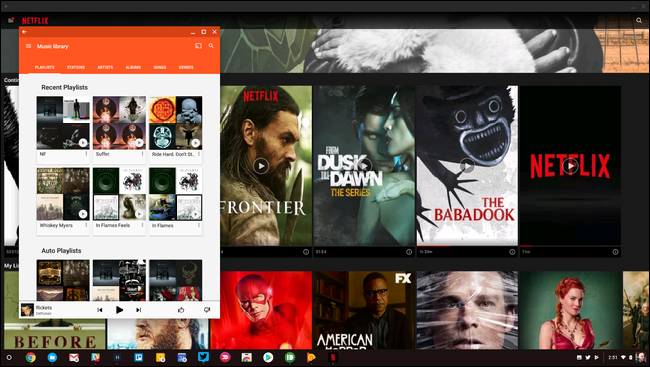 Like we’ve said before, the addition of Android apps to Chrome OS has been revolutionary for the platform. Where it lacked before—like with photo editors and games, for example—Chrome OS now excels. And with most modern Chromebooks sporting a convertible design and touchscreen, the majority of Android apps work really well on the platform. The Play Store has become our go-to place when searching for a utility to perform a specific task, which we honestly think is what Google wants. Still, this list is all about what’s great on Chrome OS in general—not just Android apps. In the current state, however, many of these utilities are available as both web and Android apps, so you’ll have to try them out for yourself to see which one best fits your workflow. And if you’re already an Android user, you’ll probably find that a lot of your favorite apps translate very well from the small screen to the bigger one.